That’s what they call themselves. Of course they do. They might admit, if they got to know you, that it’s a little trick we use to behave in a manner likely to meet resistance. Admit we’re fixin to cause a fuss, but in a good way. We’re coloring outside the lines here, (we’re “so and so’s” ); you’re going to have to do without us for an entire day every week. No cooking, no cleaning, no taxi…but hey, it’s for a good cause; we’re sewing. Confusing, huh. But who can argue with it? And there are several of us, so if you are a disgruntled husband, employer, kid, or relative who wants our attention, you’re not alone. Get over it! 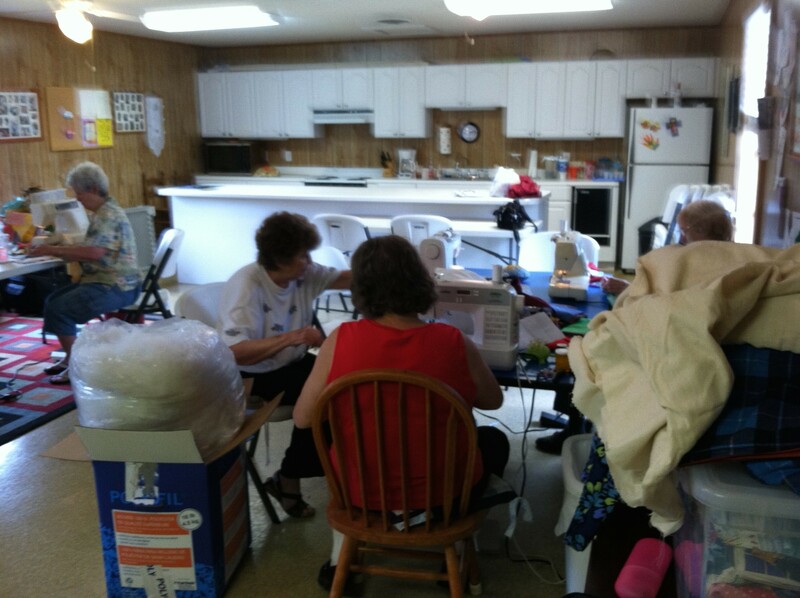 They meet once a week to sew for local hospitals, have “dinner” together and just talk, but mostly to sew. And they are prolific. Blankets, caps, pillows, aprons, smocks, quilts,.. whatever hospitals request. There is an assembly line of cutters, sewers, finishers. Patterns are “pieced” to conserve fabric, and leftovers bigger than a 4″ square are made into quilts. Quilt blocks are fashioned from pages of expired phone books. No one is paid, rewarded or recruited. Fabric is donated…or sometimes someone finds a sale. These are women with busy lives; families, jobs; all the time demands we all have. And yet here they are, every Thursday, all day. And every month, boxes of finished products are loaded into the trunk of an ancient Lincoln and distributed to hospitals and nursing homes. Of course, the idea is not new. Women have gathered to quilt and sew for centuries. As children, my cousins and I played under the quilt frame in my grandmother’s living room. I remember how excited we were to watch the frame holding the growing quilt lowered from the ceiling. For a wonderful afternoon, we were allowed to play here in our private “fort”, bordered by black lace-up brogans and long gingham dresses, accompanied by the chatter of soft voices, the tinkle of ice in sweet tea glasses, the crackle and hiss of logs burning in the fireplace, the occasional chair scraping on the hardwood floor. We knew something important, something special was happening. We didn’t know what; we just wanted to be there. These were not quilts for display, they were for warmth against the cold winter nights. They weren’t from designer fabrics, but from scraps, worn out clothing or flour sacks. (And yes, flour really did come in cotton sacks; I had dresses made from them..) Everyone worked on all the quilts and the finished products were shared by all. By the winter there would be enough for all the families. But it wasn’t about just making quilts; it was about sharing. Sharing news, joys, sorrows, hopes, home remedies, recipes, prayers. Always prayers. Especially during the war times. There was no Google, no health insurance, no Dr. Phil or Oprah, no psychiatrist; all they had was each other. It had to be enough. But those were different days. These ladies don’t need quilts for warmth. They really don’t need quilts at all. These women have traveled, held jobs outside the home, attended college. The tangible needs met by their grandmothers’ sewing circles are now met in other ways. Social media provides instant communication with family and friends. Thanks to immunizations and antibiotics, devastating diseases have been eradicated by vaccines and antibiotics. On the surface, the sewing circle would appear to have outlived its usefulness. Yet it persists, and if anything, is growing. I suspect this is because the sewing circle feeds the soul with the spirit of community, and I think this was what I sensed as a child. I think we hunger and always have, for the sense of belonging and contribution that comes from spending time with neighbors; from cheerfully responding to the needs of others, giving without thought of return. In our fast-paced, egocentric society, I think we feel the need for community more than ever. It’s certainly true for me and I am truly grateful to these ladies and thousands of other like them for preserving this beautiful tradition. .A little disclaimer here; I know these ladies. I grew up in this community; our grandmothers were friends and relatives. And as wonderful as they are, they are not unique. There are sewing circles in church basements, community centers and private homes everywhere, quietly continuing the traditions of the sewing circle. And I suspect if you asked any one of them why she does this, you would be met with a blank stare, and possibly a seat at a sewing machine. So the next time the newscast gets you down, your kid scews up Again!, someone loses a job, or you’re just having a bad hair day, maybe look up a sewing group. Might just mend your soul. God bless’m. Gypsy Queen and Southern Lady? Seriously?